MY HAND HURTS. IT MY BE CARPAL TUNNEL. My hand hurts. It must be carpal tunnel. As an occupational therapist, I hear this all the time. There are many myths surrounding hand and wrist pain, and I’m here to debunk one of them! The most common one I hear is that if your hand hurts or if you experience numbness or tingling in your hand, you must have carpal tunnel. While carpal tunnel does affect 4-10 million people in the U.S., pain or tingling in your hand doesn’t necessarily mean you have carpal tunnel. In order to understand if you’re suffering from carpal tunnel or not, let’s first take a look at the symptoms of carpal tunnel. What symptoms are associated with carpal tunnel? Numbness or tingling in the thumb, index finger, long or middle finger, and ½ of the ring finger. Pain that doesn’t improve at night or with rest. This is a common tell-tale sign of nerve pain. Tendonitis will improve when you rest the muscle but nerve issues aren’t likely to improve with rest. In fact, nerve pain may cause you to awaken with increased pain and cause sleep issues. Weakness in your hand, especially pinch strength. This is due to the fact that the muscles of the thumb aren’t getting adequate innervation. When looking at your hand the thenar muscles (muscle tissue at the base of the thumb) may actually be smaller or atrophied if you’ve experienced this issue for a prolonged time. Repetitive work, especially when working with fine motor tasks or in a position that places your wrist in a bent or flexed position. This position causes compression at the carpal tunnel and takes up any extra space that may have been in the tunnel, thus cause compression on the nerve, resulting in increased numbness and tingling. Working in a cold environment. How do I know if my wrist or hand pain isn’t carpal tunnel? The best way to determine whether or not you have carpal tunnel is by having an examination with your therapist or physician. At Kinetic Edge, we’ll do a variety of tests to determine the root cause of your pain. If further testing is necessary, we may recommend a nerve conduction test. However, if your small finger is the number finger, you can take a breath because that indicates you don’t have carpal tunnel! The ulnar nerve innervates the small finger and that side of the ring finger. Your pinky finger pain is more likely related to an elbow issue or inflammation at your wrist, just not at the carpal tunnel. Another common issue often mistaken for carpal tunnel is arthritis, especially of the thumb. A therapist at Kinetic Edge can help determine if that is the issue by running you through a series of tests and then help you determine the best course of care. What can I do to find relief? Splinting can be used to help alleviate pain and improve your function. However, correct diagnosis is important to determine the best splint. Night time splinting will often decrease carpal tunnel symptoms. However, I would recommend a splint that keeps the fingers somewhat straight. 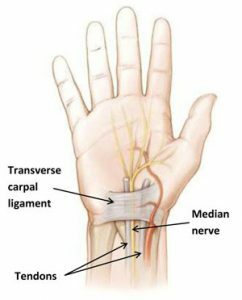 In doing so, the tendon that attaches to the tips of the fingers is essentially pulled out of the carpal tunnel, creating increased space and taking pressure off of the median nerve. If you wake up in pain and your hand is fisted, you may benefit from a specialized wrist brace to keep your hand open as this will not be accomplished by a standard canvas wrist brace. The other downside of a wrist brace with a metal insert is that it can add compression at the base of the hand, when in reality you should be trying to eliminate extra pressure at the base of the hand and wrist. If arthritis is your issue, there are several splints that provide support to the base of your thumb to specifically relieve pain and improve stability. This helps improve your function when writing or using utensils and other tools. How can Kinetic Edge help? Most importantly, a therapist at Kinetic Edge will determine the actual cause of your problem. This is crucial to determining the appropriate next steps and care. Based on the diagnosis, your therapist will prescribe exercises to work on either improving your mobility/range of motion or improving your stability. Not all exercises work for everyone so determining your specific needs is crucial to your success. The therapists at Kinetic Edge also incorporate strengthening exercises progressively as necessary to improve your strength and get you back to the activities you love and need to do. We’ll also explore safer and more effective ways to do your activities to avoid re-injury and improve the lasting benefits of the skills achieved in therapy. For example, simply changing how you open containers, stir a hot pot of soup, or turn on a faucet can improve joint health in your hands over a prolonged time. Bad habits can be hard to break, but we’ll help you develop better ones for a lifetime of doing what you love without excruciating pain. 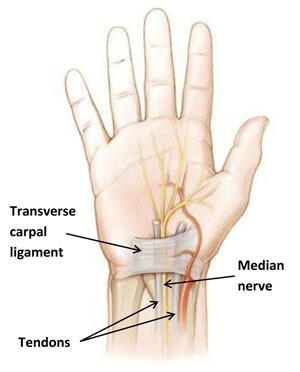 Want to find out if your hand pain is actually resulting from carpal tunnel? Contact us at 866-588-0230 to schedule a free 20-minute carpal tunnel screen. We have 10 slots available at each of our clinics this month, so call today to reserve your spot.